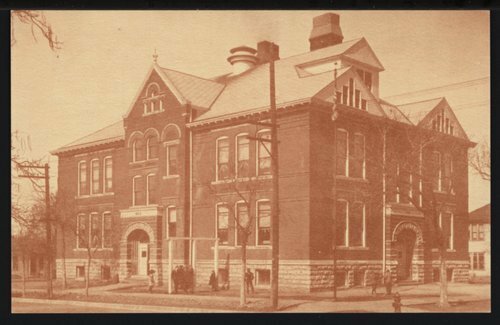 A photograph postcard of Central School, located at 5th and Pine in Pittsburg, Kansas. The building was dedicated January 30, 1884. It was designed by George Munn and the contractor was Mr. Goodlander from Ft. Scott. The first floor was the superintendent's office and rooms for first to third grades. The second floor was for the high school. The third floor was the gymnasium with a state at one end for concerts. It was used as a school until 1903 when the new school was built. Then was used by the State Manual Training School from 1904 to 1925. After the SMTNS moved out, Central School once again became a city school and was remodeled in 1925, almost doubling its size. The building was used until about 1953 when Central School and Forest Park School were closed and the students were consolidated into the new Westside School on West Fifth between Miles and Olive. The city used the vacant Central School building to house its offices while the City Hall at 4th and Pine was torn down and a new one was built in the late 1950's. Not long after the city moved out, the school building was torn down. Today the site is occupied by the Bottenfield Building.